A week ago it was my colourful, bubbly friend's birthday. 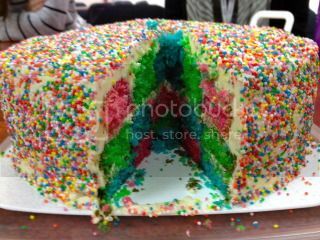 So what better to do than make the brightest cake I could? When I was in Hong Kong I managed to pick up a checkerboard cake tin set for less than $10. After seeing all the disastrous versions online, I thought I'd give it a shot, with expectations set pretty low. What tends to happen with these tins is the batter runs together and you don't get the perfect checkerboard effect, more a warped effect. No matter! I had a plan! All you need to do is bake the cakes individually in the tins provided. Then, once they are cooked, use the divider as a cake cutter to get 3 rings from each cake. After a bit of swapping and gluing with strawberry jam and buttercream, I ended with this! 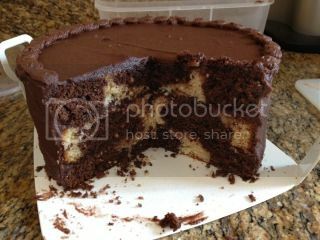 I was so afraid that the cake would fall apart when cut, as it did not look stable at all when I was constructing it. Thankfully it stayed all in one piece. Big win! For this cake I used Steph over at Raspberri Cupcakes' recipe. I also nicked her idea of coating the cake in 100s & 1000s. I also managed to coat my kitchen in 100s & 1000s in the process! The cake was so light and fluffy. It was almost too delicate for chopping up into rings. It requires a bit of patience and light fingers! 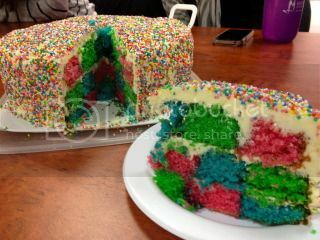 I can't wait for my next colourful cake!